View through the Shop Window: Sock it to me! 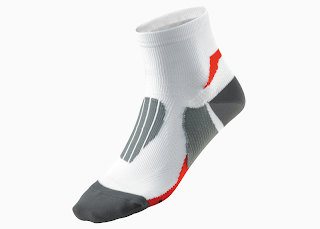 All to often the importance of proper running socks is overlooked when choosing footwear for your endurance running. Without going into a long and convoluted discourse about the mechanics of the foot during your running stride ie gait, suffice to say that at the point of maximum force generated through the foot, your arch will flatten, your toes stretch forwards and your foot splays out the result being that your foot can be a shoe size longer and a size wider. At this stage we should all be aware of the importance of correctly fitting a running shoe, but did you realise that the socks are just as important? Cotton socks are a no, no. The cotton absorbs sweat, retaining it close to the skin, softening the skin (making your feet clammy) and being the primary cause of 'hot feet' and blistering. Don't run in cotton socks! Instead use purpose made sports or running socks with wicking materials to draw moisture away from the skin and which will allow the evaporation of this moisture through the mesh upper of the running shoes. The socks may have additional features such as spandex to wrap the foot or heel pads for additional comfort. You are going to spend time on your feet working hard so they should be as comfortable as possible. The most important factor about choosing your socks is to get the size right. Most will come back a little in size with washing so be sure to have wiggle room (sorry about the pun!) by going up a size. This will also mean that your toes will not be constrained by the socks, which can also be a contributing factor to runners toenails and subsequent loss of said nails. My own personal favourite is the Mizuno Biogear range of socks which feature Drylite moisture management and a really comfortable band of support around the arch & plantar areas of the foot. An expensive sock, but not as costly as losing toenails or developing blisters in a marathon.